Nothing else has help me so much like Bone Strength Take Care. Pure Formula also sell cheaper. I wanted a whole food calcium in a small tablet easy to take form. Bone Strength Take Care Tiny Tabs as a perfect fit. I have only been takingBone Strength Take Care Tiny Tabs by NewChapter about one year, I have osteoporosis and feel I found what I need. 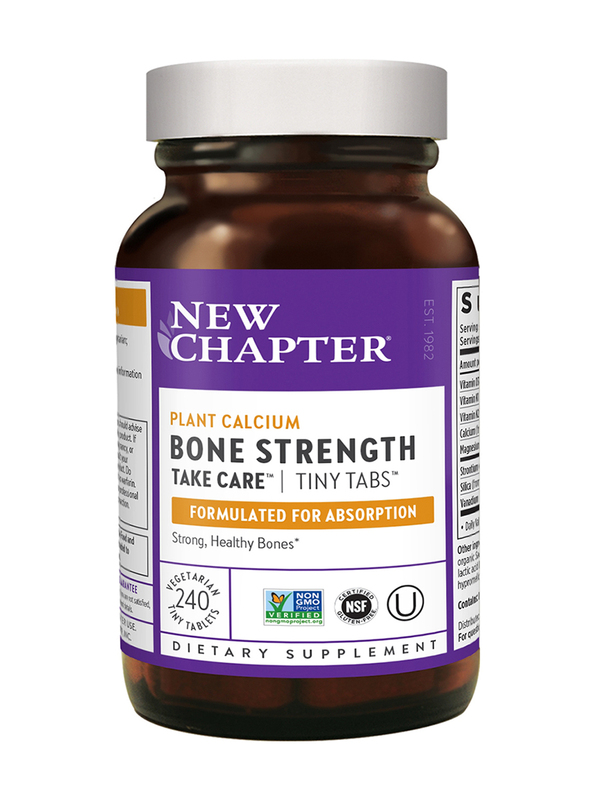 Bone Strength Take Care™ Tiny Tabs® - 240 Tablets from NewChapter® reportedly provides important nutrients to your bones and joints and keeps them healthy. 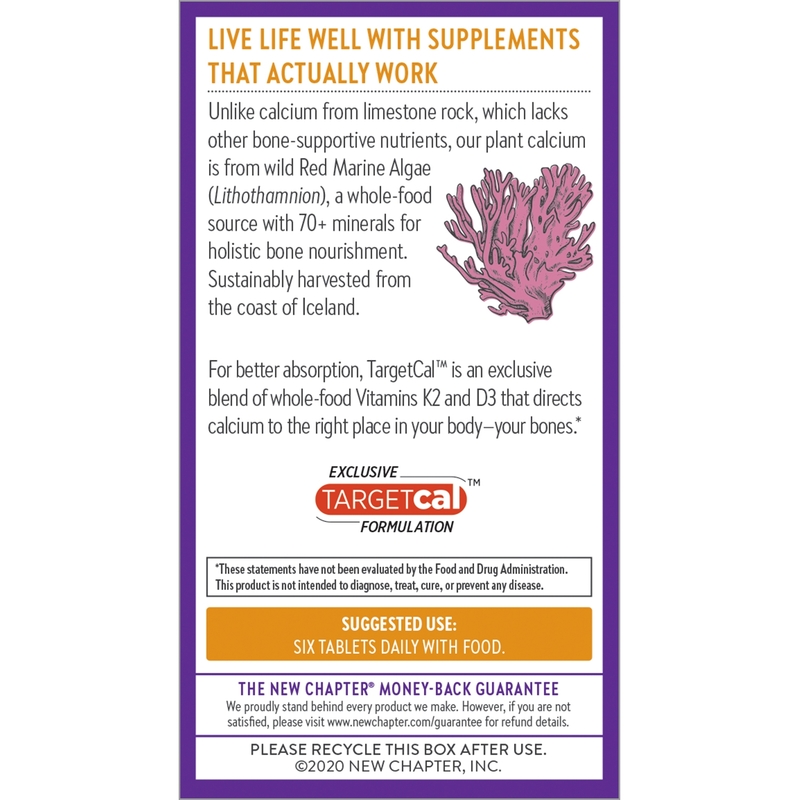 Calcium and magnesium‚ derived from algae Lithothamnion calcareum and corallioides‚ help strengthen bones‚ prevent mineral loss‚ and promote bone growth and maintenance. These minerals may also maintain joint comfort and mobility‚ support certain facets of heart health‚ and promote your general wellness. Vitamin D3‚ as cholecalciferol from culture media‚ could potentially improve the absorption of calcium in your body and ease conditions such as weak bones‚ pain‚ bone loss‚ and fractures. It may also alleviate joint pain‚ respiratory discomfort‚ autoimmune conditions‚ and infections. 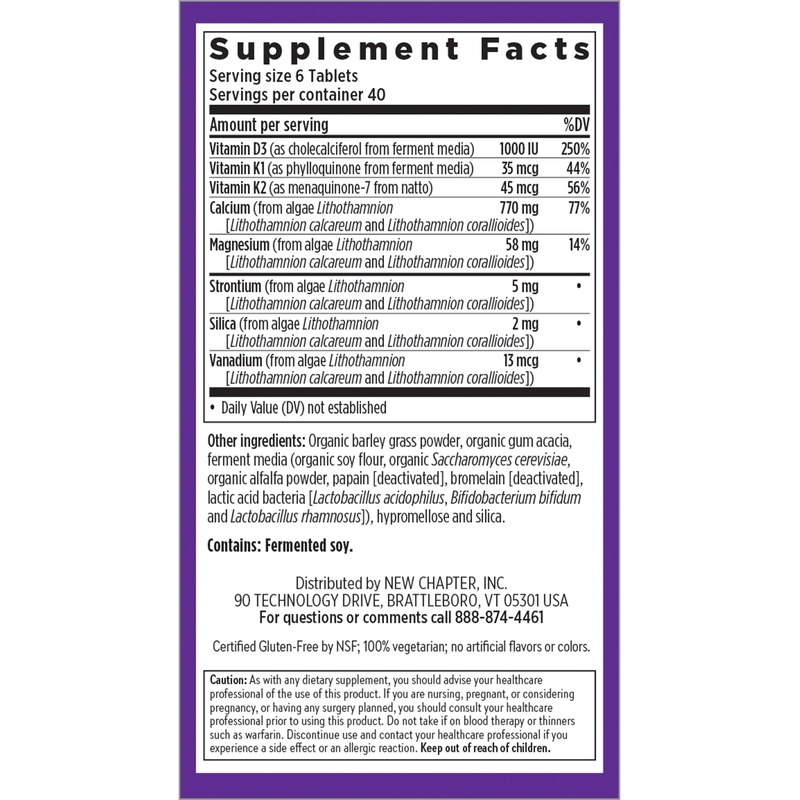 The presence of vitamins K1 and K2 in this dietary supplement from NewChapter® reportedly retain calcium in bones‚ increase bone mass‚ and prevent fractures. 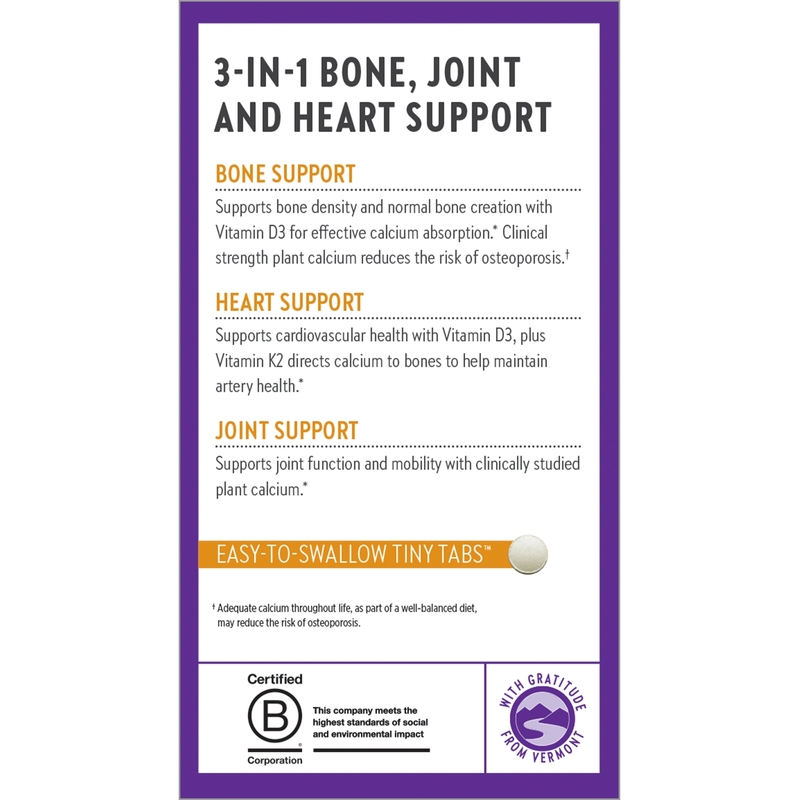 While strontium and silica could potentially reduce thinning of bones and increase the production of collagen and cartilage in joints‚ vanadium helps improve athletic performance and supports certain facets of heart health. 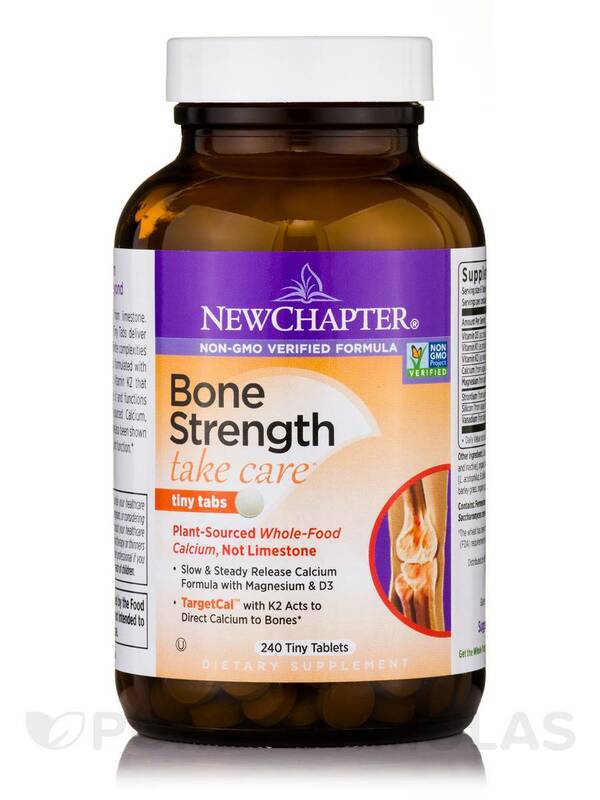 Bone Strength Take Care™ Tiny Tabs® - 240 Tablets from NewChapter® also contains alfalfa powder‚ barley grass‚ gum acacia‚ lactic acid bacteria and more to ease joint pain‚ inflammation‚ and other conditions. † Nutrients are cultured in organic media that may contain: organic milled soy‚ organic yeast (Saccharomyces cerevisiae)‚ organic maltodextrin‚ organic gum acacia‚ organic alfalfa powder‚ enzymes and Lactobacilli (L. acidophilus‚ L. bifidus‚ L. rhamnosus). ‡ Lithothamnion: L. calcareum and L. corallioides. Other Ingredients: Organic barley grass‚ organic gum acacia‚ modified cellulose‚ silica‚ sunflower oil‚ and Bacillus subtilis natto extract. 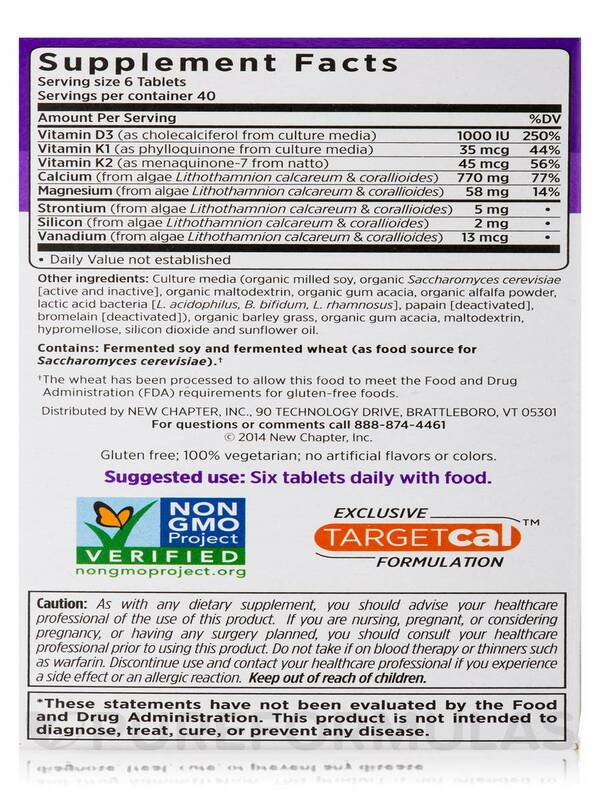 Take six tablets daily in the middle of a larger meal. For best results‚ take two tablets with lunch and four tablets with dinner. 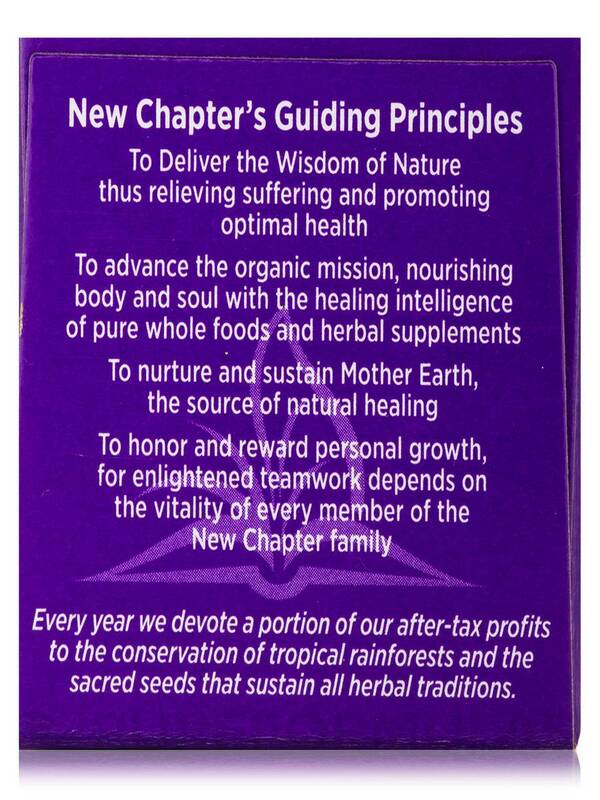 As with any dietary or herbal supplement‚ you should advise your health care practitioner of the use of this product. For use with children or if you are nursing‚ pregnant‚ considering pregnancy‚ or taking Coumadin/Warfarin‚ you should consult your health care practitioner prior to using this product. I like the small tablets, not at all hard to swallow. There is nothing I dislike, they seem perfect! Little pricey but feel you get what you pay for. 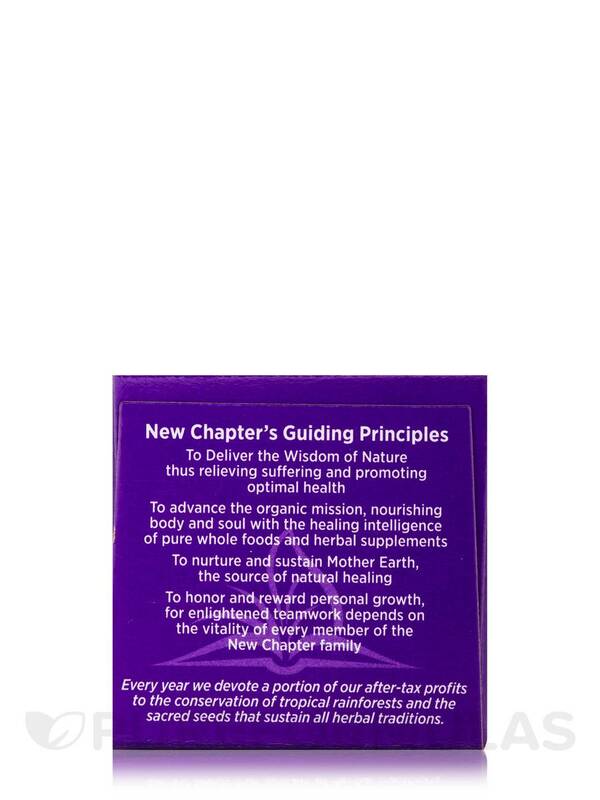 I love taking Bone Strength Take Care by NewChapter because I need to have extra calcium at my age and I hate to swallow big pills. These are great and very good quality. There isn't anything that I don't like about this item. 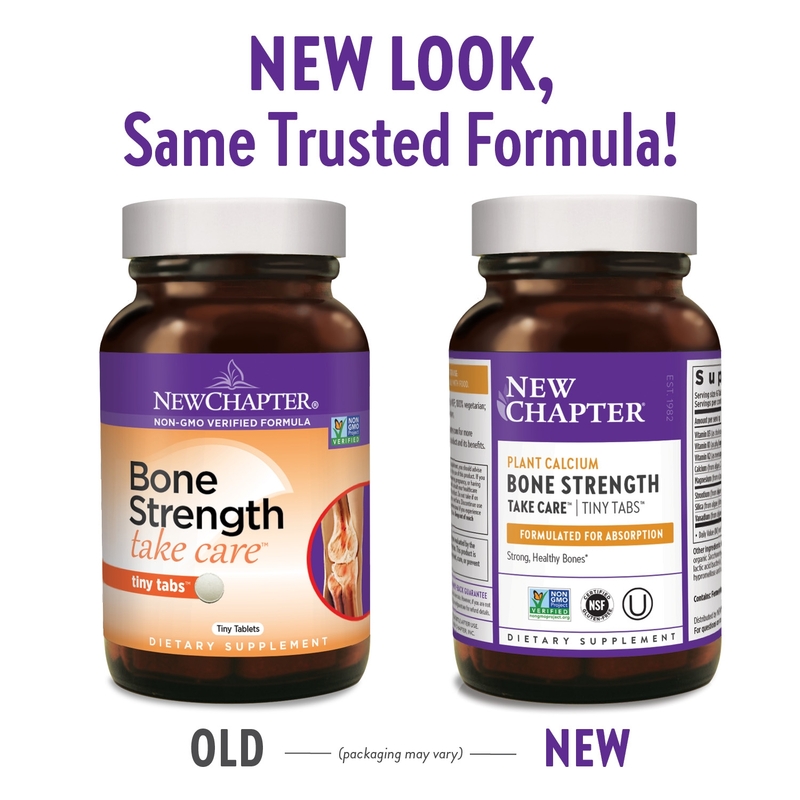 I recently purchased 2 bottles of the Bone Strength Take Care Tiny Tab by NewChapter through the PureFormulas website and I was very happy about the way they take care of their customers. The site is very easy to use, the product is at a competitive price, and I also got a little discount for being a customer. This was the second time I had placed an order with them. My order was at my door just 2 days later. I am a very happy customer and will go back to PureFormulas for my next purchase. This item keeps my bones strong. I was diagnosed with Osteopenia. I had been having a lot of pain in the bones, in my joints and in my back. Now I take 7 pills of Bone Formula a day, together with vitamin D and a little zumba. Now I feel better. I hope to be healthier for my next check-up at the Doctor. 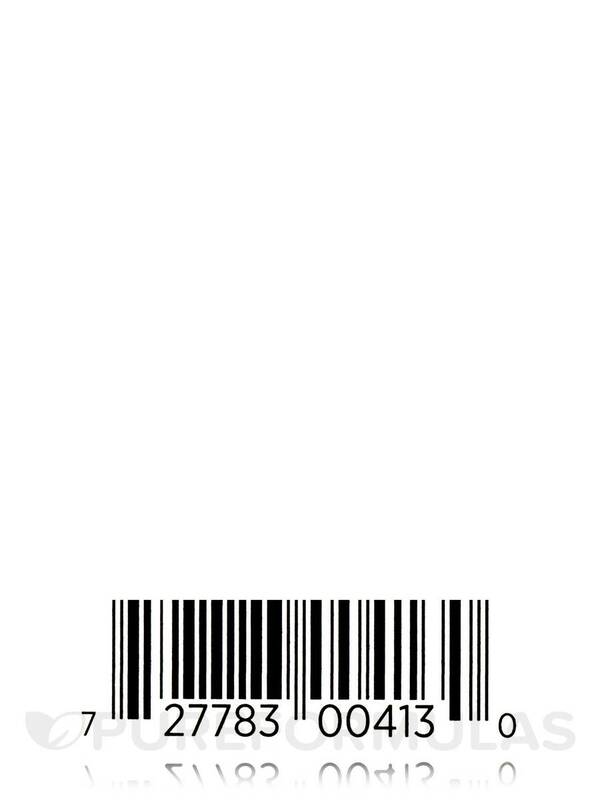 There is nothing I dislike about this item. The pills are small, easy to swallow and I take control of how many I want to take per day versus other vitamins that are very big and they don't offer a lower dosage. These little pills give me control of the amount of dosage that my body needs. 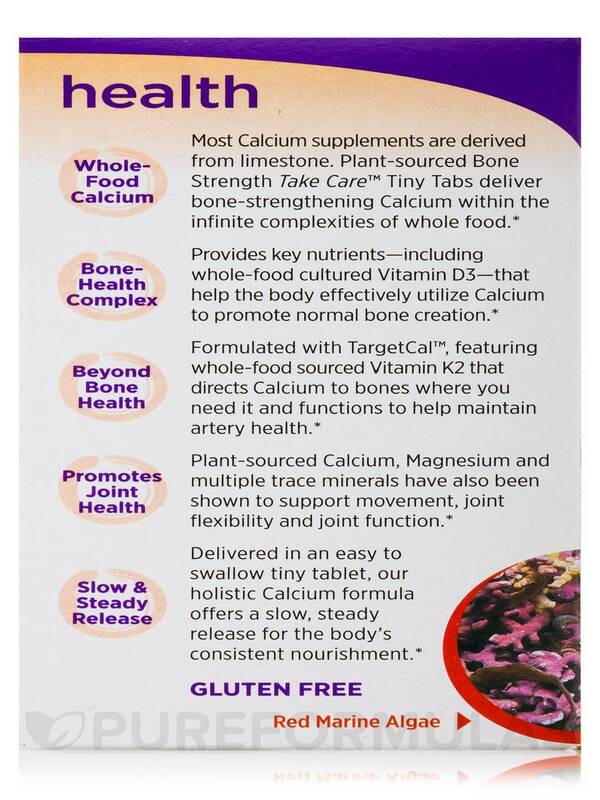 Bone Strength Take Care Tiny Tabs is great for strong bones. Calcium. Great supplement and affordable. I took Bone Strength Take Care Tiny Tabs along with Zyflamend and got rid of knee pain. My P.A. said that calcium from algae is best for the heart arteries and bones. 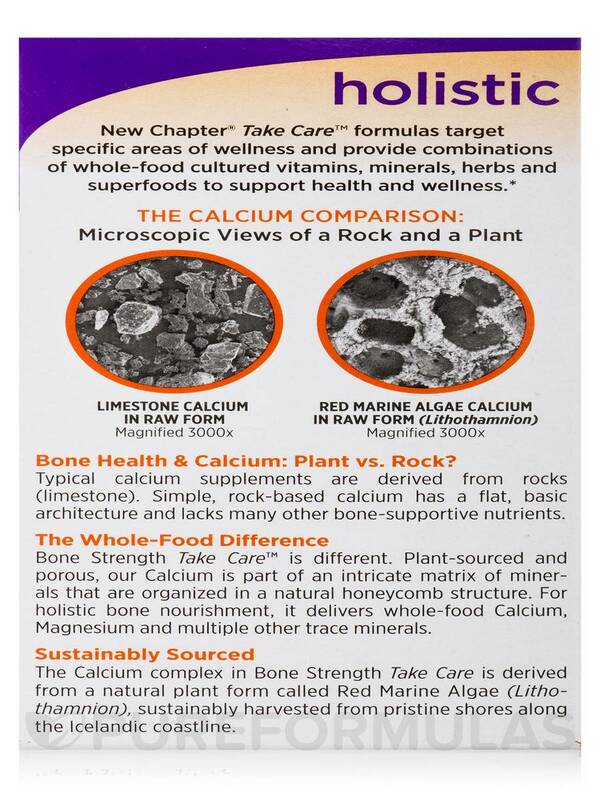 Bone Strength Take Care Tiny Tabs is from an algae source and has other minerals to help with the calcium absorption. I just started taking but I do like the small size (flat round) which is so easy to swallow.